- Corps against Poles in Upper Silesia: White flag with white bordered yellow maltese cross. 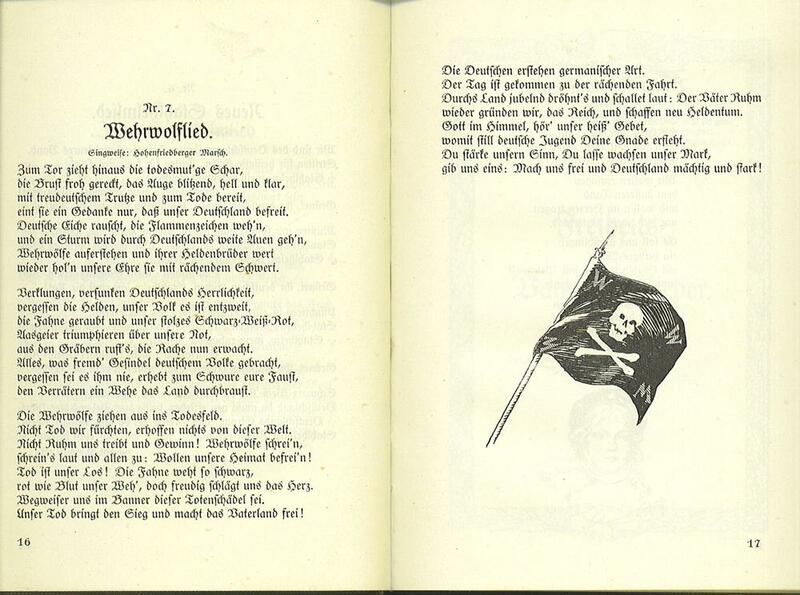 - Hamburg Corps: Red flag with white castle of Hamburg but above flag a black pennant (meaning the Frison pirates). - Rossbach Corps: Black flag with two silver diagonal stripes and a silver 'R' in centre. - Unidentified corps: light blue flag with white-bordered yellow Maltese cross. - black flag with white skull. - black flag with white circle in centre containing a second red circle a bit smaller, and white skull within the red circle. Additional Freikorps information that might be of interest can be found at the AHF forum. On March 13, 1920, a monarchist group led by a minor official named Wolfgang Kapp, General von Lüttwitz and Captain Ehrhardt, seized Berlin, declared Kapp Chancellor and Lüttwitz commander. They were defeated by a general strike of the workers and government officials after four days. The Kapp putsch used the 1903-1918 Imperial ensign as their flag (not the 1919-1921 ensign). The 2nd Marine Brigade commanded by Lt Cdr (usually referred to as Kapitän) Ehrhardt [the Brigade Ehrhardt] flew the Imperial Kriegsflagge in their parades and over the castle which served as their headquarters and subsequently as their flag during the Kapp putsch which they spearheaded (of some 20 pictures of Kapp troops I have seen, 19 show the imperial Reichskriegsflagge, one the black-white-red tricolor). I'm curious about the Roßbach flag illustrated, what is the source of that image/information? In the information and photos I've seen of their flag it was in black with a large capital R (larger than the one on your illustration and not anything like that font, more basic font such as Arial) and the two lines are horisontal, one going through the upper part of the R and the other the lower part of the R. I can send you a scan of a photo of the flag if you are interested. Rossbach Corps: Black flag with two silver diagonal stripes and a silver 'R' in centre. The source for Jaume's image is probably an article in "Banderas", [gfo00]: Juan Gual Fournier (2000) Los cuerpos francos alemanes. in: Banderas iss. 77 (2000), p. 31-33. The description and drawing in this article corresponds very well with Jaume's drawing. It is so much different from the flag described by Marcus Wendel, that I would suggest it is a different flag that actually existed; maybe a second flag of Freikorps Roßbach or perhaps of a different unit. The Werwolf Freikorps (Werewolf Free Corps) was one of many small active paramilitary units that fought for control of the streets of Berlin and Munich during the politically turbulent Weimar era. In 1923, this veterans group which named itself Werwolfbund Deutscher Männer und Frontkrieger (Werewolf Organization of German Men and Front Line Soldiers) was formed as apparently part of the Heydebreck Freikorps. Initially formed during the Red Revolution of November 1918, Peter von Heydebreck, a German World War I veteran, founded this counter revolutionary Freikorps, which was apparently named after himself. This fanatical right-wing predecessor of the future National Socialist brown shirts, or Sturmabteilung (SA/Storm Troopers), soon became involved in violent street fights and melees with communists and other left-wing militias, such as the League of Red Front Fighters (Red Front) and the Spartacists. During this period of time various homemade flags and standards were used by these factions of the Free Corps. Heydebreck, who later become one of many SA victims of the Hitler´s night time purge known as the "Night of the Long Knives", wrote a book of his Freikorps experiences, entitled Wir Werwölfe (We Werewolves). Image Source: Based on drawing from a German Song Book (Song of the Werwolf Freikorps).